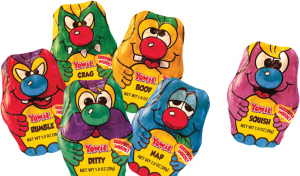 The Yowie Group has announced the expanding distribution of its popular Yowie chocolates into more stores across America. Each Yowie chocolate has a kid-friendly animal figurine inside, just waiting to be found. Yowie chocolates will be available in two national tier-A drug and convenience chains, available from May in up to 8,500 7-Eleven franchise stores and 6,000 CVS Health retail outlets across 49 states. The 7-Eleven and CVS stores join national retailers like Circle K, Walmart, Walgreens, Cost Plus World Market, and grocery chains such as Albertsons, Food for Less, Lucky Supermarkets, Raley’s, Safeway, and Vons in carrying the delicious chocolates that have an important message for kids – please save the natural world. Each one-ounce Yowie chocolate, created in the shape of various characters and wrapped in foil, contain limited-edition collectible animal figurines, called Yowie playmates, and a leaflet that profiles the animal, its habitat, food sources and threats to the animal and its environment. With a focus on conservation, each animal is colour-coded to explain whether it is critically endangered, endangered, vulnerable, near threatened or not threatened. The combination of tasty chocolate and fun animal figurines encourages kids to learn about the natural world and understand its need for protection. The current Yowie series includes 26 playmates, 17 wildlife animals, 2 Yowie vehicles, a Yowie Yurt and six Grumkin (Yowie villain) characters. For more exploration, Yowie World online provides the backstories on each character, fun, age-appropriate games and entertaining videos.